In Feng Shui, a mirror facing the front door can have a bad reputation. 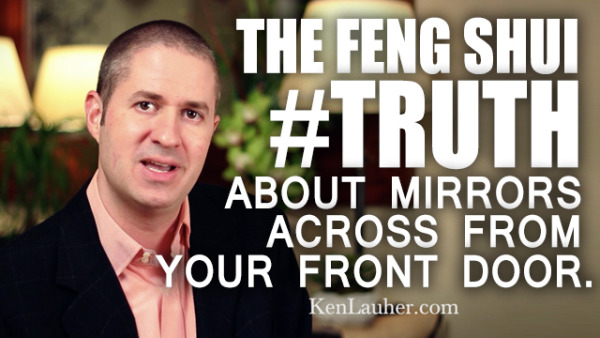 Have you ever heard that having a mirror directly across from your front door or entrance is bad Feng Shui? In today’s episode, we’re talking about the Feng Shui myth and truth about having a mirror placed directly opposite your front door. Some believe that having a mirror directly across from your front door is a Feng Shui no, no. That it pushes the energy right back out the door. And with it, pushes out your money, health, wealth and new opportunities. Keep in mind, that if the chi or energy is not first able to flow freely into your home, it won’t matter much what you do inside the home because it will have such a small impact due to the lack of chi. And more than likely, you’ll feel tired and constantly exhausted resulting in no energy to actually take action if the chi is not circulating inside your home. So if you’ve struggled with understanding Feng Shui and having a mirror facing or being directly across from your front door, today’s episode is for you. And you'll also discover how you can create a front entrance that will welcome new opportunities that bring with it wealth, health, abundance, career growth and a vibrant love life.